You still have to provide other pieces of the safety puzzle. Even smoke alarms with long-life batteries need testing. 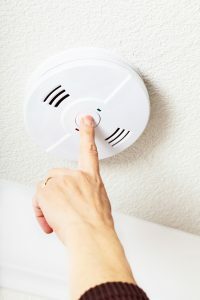 Fire departments and injury prevention organizations like Prevention 1st are celebrating the upcoming implementation of New York State’s new smoke alarm requirements. As of April 1, all smoke alarms sold in New York must have a 10-year, sealed, non-removable battery, which will undoubtedly prevent a significant number of fire deaths and serious injuries. Missing or dead batteries! Well-meaning people, annoyed by the sound of a dying battery, or by one that is doing its job around a smoky kitchen or steamy bathroom, take out the battery. So do people who are in immediate “need” of a battery for a remote control or other device. Regardless of reason, most people have every intention of replacing that battery, but just don’t get around to it, with sometimes tragic consequences. Test your smoke alarm regularly. Long-life batteries are just that – but “long life” may not be ten years. Batteries can and do fail, so continue to test them once a month. Be ready to replace it before ten years is up. A 2008 CDC-commissioned study found that after ten years, 78% of smoke alarms with lithium batteries were that were installed through a public outreach program were still operational. That leaves 22% that were not. Keep testing! This article also appeared as an op-ed piece by Prevention 1st president Molly Clifford in the March 23,2019 issue of the Rochester Democrat & Chronicle. ← Prevention 1st Fire Safety Poster Contest Winners Announced!